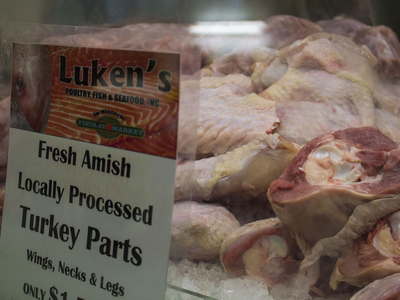 Neil Luken started working at Findlay Market at age 12, when his brother Mike opened Luken's Fish and Poultry in 1978. When it came time to go to college he studied accounting and worked as an accountant for three years. But he came back to the Market because, as he says, it was just in his blood. 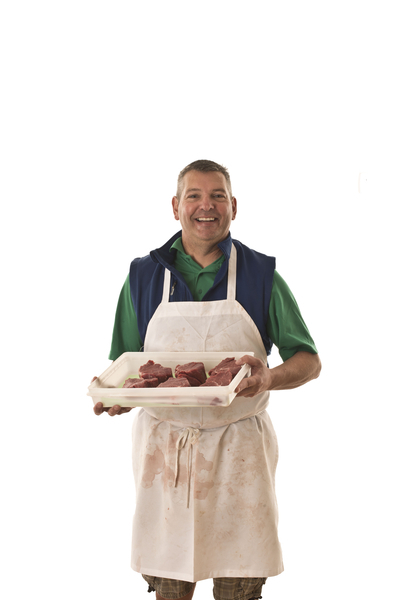 With his business background, he confidently took over Charles Bare and Sons Meats 1995. He bought the stand from Tony and Joe Bare, who were third-generation merchants. Their father was Charles Bare, Jr. Their grandfather, Charles Bare, Sr., opened the stand in 1909. Neil describes his stand as full-service. He isn't known for any one specialty, but rather as a merchant who offers a full line of high quality meat at a very good price. This is the stand to visit if you're into grilling. He's got it all: steaks, chops, burgers, ribs, chicken, and sausages. Here's where you can get Choice beef from Oklahoma cattle. It's also where you can pick up lunchmeats and cheeses. And in case you were wondering, turkeys do have tails. That's another product he offers. Neil is the chairman of the Findlay Market Opening Day Parade, which the merchants' association sponsors each year for the Cincinnati Reds. He's been doing that since 1998. As chairman he does just about everything to produce the event, which has been an annual Cincinnati tradition since 1919. He even gets to decide who will be Grand Marshal every year. Neil tells great stories about the parade. One of his favorites is about the year they held the Opening Day Parade, but there was no Opening Day. The players were on strike and the leagues had lined up replacement players for the season. At the last minute, however, the leagues canceled plans for a season of replacement players. But, since everything was set up and ready to go for the parade, they went ahead with it. It was one of the best attended parades ever. And the next day, the parade was on the front page of the Wall Street Journal. That wasn't the only year the parade marched on without a game afterwards. Once, over the protests of owner Marge Schott, the National League scheduled a night game as the Reds' season opener. So the Reds played at night and the next day Cincinnati had its Findlay Market Opening Day Parade. 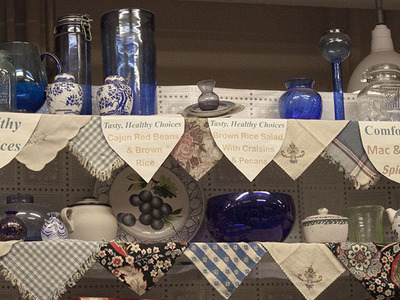 Neil chooses to make his living at the market because he says the atmosphere can't be found anywhere else in Cincinnati. He has customers who have known him since he was a kid. They ask about his family. If he's in a bad mood they call him on it. And if he says, "Hey, I'm not here to entertain you," he knows they'll be back next week. They know he'll be there too, bad mood or good, providing quality meat and service at a great price. What can he do? It's in his blood.